PK additives are necessary during the flowering or fruiting phase of a plant. A variety of flowering additives are available, however PK additives are the most common type. PK additives primarily contain phosphate (“P”) and potassium (“K”). These elements are essential during the flowering and fruiting phase. 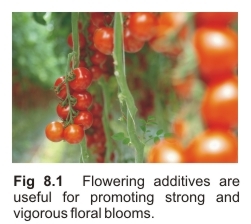 Although bloom nutrients contain phosphorus and potassium, heavy fruiting plants such as tomatoes and peppers have an especially high demand for these elements. Hence, PK additives are used in conjunction with bloom nutrients to help ensure no deficiencies occur*. They are also a more economical alternative compared to using extra bloom nutrient. *Note that EC readings will not help determine if sufficient potassium and phosphorus is in reserve. Organic plant-growth-regulators such as auxins, gibberellins and cytokinins are also useful components of flowering additives. These help promote fruit set and growth (see “PGR” section).